VISUAL ARTWORK established in 2010, We are a professional enterprise specialized in developing, designing and manufacturing canvas prints ,canvas roll and handmade oil paintings. We have Roland, Epson, MUTOH and HP printers, a special oil painting studio and an outstanding artist team. We're always devoted to making excellent and quality guaranteed products at reasonable price during the past years and will do better in future with your supporting. Our items are sold to customers who are from all around the world. Sea Canvas Wall Art,Giclee artwork,Eco-ink resolution, printed on water-proof canvas.A great gift idea for your relatives and friends. Stretched and Framed, Ready to Hang.Gallery wrapped on wood bars,Light artwork upon sofa wall decor art. 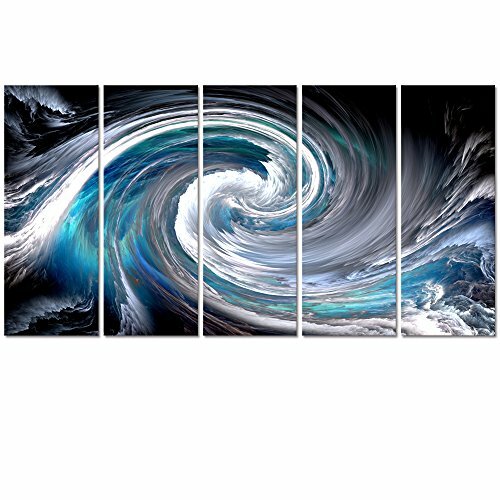 Size: 12"x32"x5pcs(30x80cmx5pcs).Any other size you want,please contact us via Amazon,custom made size offered.Please be noticed that measure your area before purchase so that you can have an appropriate conception on the comparison of the painting size and your area.